My new favorite craft: rug hooking! I joined the Green Mountain Rug Hooking Guild and then helped them with a WordPress site that is easier to deal with than the site from Wild Apricot, a membership management software company. They still use Wild Apricot for membership functionality, but users view and register for guild events, renew their memberships and access a members forum via iframes imported from the WA server into the WordPress site. 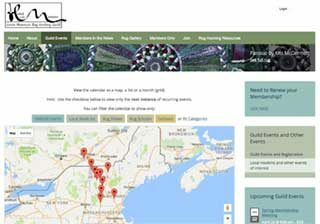 This site features a Community Calendar, with events displayed as pins on a map. This plugin from the folks with The Event Calendar allows our members to create events for local “hook ins” or other events, workshops, rug schools or wool festivals of interest to the membership.